ESVAGT, together with the Lauritzen Fund, Fulton and the municipality of Esbjerg, has entered into a project to break negative social legacy and help young people into education and work. ESVAGT is investing significantly in strengthening and developing Fast Rescue Boat (FRB) sailing skills for its employees. Over 200 ESVAGT colleagues are currently in career advancing training in the shipping company. Torben Stamer has set his sights on navigation training. It will be used at ESVAGT. A systematic approach will ensure the optimal level of FRB sailing competence for all vessel crews. Young people with a chequered past can turn their lives around and look forward to a promising future with Headspace. ESVAGT offers support. ESVAGT LEADERSHIP EDUCATION 2015: Modules in situation-specific management, difficult meetings and psychological crisis management will give ESVAGT officers more tools to be better leaders. What makes ESVAGT a good workplace? The officer seminar strengthened relations in the shipping company. Dinner’s starter became wandering tapas to make time to meet even more colleagues. ​ESVAGT do not only train future mariners – they are also actively involved as training place for clerical workers. Student assistants are currently employed in Chartering, Ship Management, HR and Management. 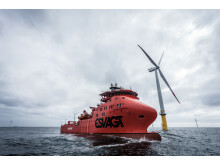 70 percent of one class from Svendborg Maritime School applied to join ESVAGT. Recruiting skilled employees is crucial for ensuring continued growth for the shipping company - so ESVAGT trains its own future mariners. ESVAGT employed six new colleagues directly from the Georg Stage during the Tall Ships Race.